Today Nintendo closed out the 2018 E3 press gauntlet with a streamed conference that was largely focused on Super Smash Bros. Ultimate, with only a few other announcements peppered in for flavor. We got news of a couple of anticipated ports (Fortnite and Hollow Knight), a couple neat indie sequel announcements, and a trailer for a proper Switch Fire Emblem. But by and large, this was a Smash-centric conference. Let’s go over everything Nintendo showed. Super Mario Party will let you use Switches in a fascinating way. The trailer for Super Mario Party showed a group of four people laying two switches on the table and rearranging them and using both screens. Pretty cool! It reminded me of Sifteo Blocks, an alternative gaming system from a few years back that was probably ahead of its time. The people in the Mario Party video also played on a TV in a more standard Mario Party configuration. The game will be out on October 5. Xenoblade Chronicles 2 is getting some DLC. I didn’t play this game, but I gather some people like it more than others. To that first group: enjoy some DLC! Fire Emblem will arrive on Switch as Fire Emblem: Three Houses. Heck yeah, man. I’ll admit I’ve never managed to get super into a new Fire Emblem game since Awakening stole my heart so many years ago, but I’m stoked for this series to make a proper Switch debut. It’s coming in Spring 2019. Fortnite is indeed coming to Switch... today! We already reported this one, but now it’s official: Epic’s earthshakingly popular battle royale game Fortnite is coming to Nintendo Switch. The battle royale mode will be free as always, and it’s out... today! They said it’ll hit the eShop at 10am Pacific, so it should be up by the time you’re reading this. Go forth and do battle. Hollow Knight is also out on Switch... today! Nice! I’ve been looking forward to playing this on Switch. I’ve heard nothing but good things. We learned a lot more about Super Smash Bros. Ultimate. Nintendo’s storied crossover fighting game won’t just have a huge roster: it’ll have an all-encompassing one. Super Smash Bros. Ultimate will feature every fighter from every single Smash game in history. Dang. Nintendo described it as “the biggest crossover in gaming history,” which seems like it’s begging for some Infinity War memes. Eight player battles are also making a return. Phew. Got all that? The game will work with a GameCube controller, since that’s the preferred input method for a lot of players. It’ll also work with all Amiibos, and you can transfer your FP data from previous games. Last but not least, they introduced a new challenger: Ridley, the long-requested Metroid beast, will be playable! They also detailed a bunch of mechanical changes coming to the game, which you can watch in the video above the roster list. 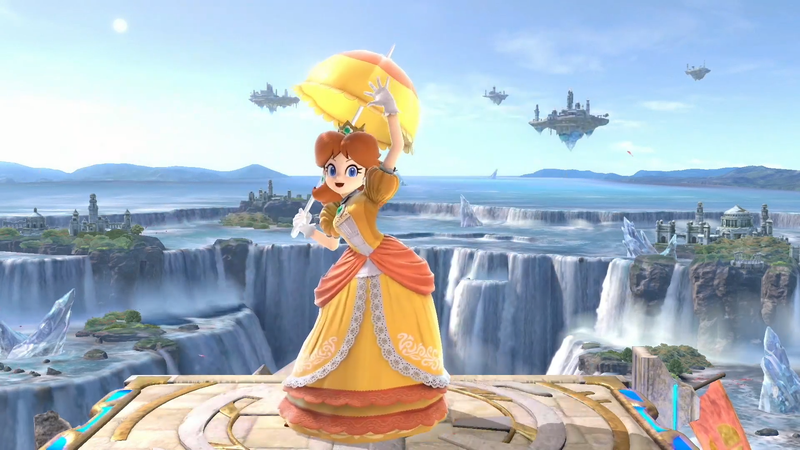 I’m a Smash scrub and don’t have the chops to break it all down, but my colleague Cecilia D’Anastasio is an expert, and she’s written a post detailing everything we know about the game. So go read that. The Splatoon 2 Octo Expansion is coming out... tomorrow! Nintendo revealed this one during their post-show livestream. Octo Expansion will be out tomorrow on June 13, which, heck yeah. They’d said earlier that it wasn’t coming until July. Can’t wait to check it out. Nintendo also announced on Twitter that free updates to Splatoon 2 would continue to the end of 2018. Three Octoling Amiibo are inbound as well. I have a single Amiibo. It is from Splatoon 2. I will never buy another Amiibo. But if I did, I would maybe get one of these. They’re coming later this year. A few more things: Pokemon Let’s Go Pikachu and Eevee are both coming on November 16, along with the Pokéball plus accessory, which will unlock Mew in the game; a version of the legendary competitive arcade Killer Queen is coming to Switch later this year as Killer Queen Black; Overcooked 2 is also coming coming to Switch; there’s a Switch mech game called Daemon X Machina; DragonBall FighterZ is indeed coming to Switch this year, as is SNK Heroines Tag Team Frenzy; and there’ll be a new demo for Octopath Traveler (out in July) on the eShop today; and there was a sizzle reel announcing a bunch of third-party games and ports, too. And that’s that. Not exactly a jam-packed conference, eh? Your enjoyment probably hinged on how stoked you are about Smash Bros. As for me, I’m gonna go play some Hollow Knight on Switch and dream of a day where I can play Metroid Prime Trilogy on the same system. That’ll do it for our coverage of the E3 2018 press conferences. You can find roundups of all of those press conferences below. The E3 show floor is about to open, and our reporters on the ground will be there to play games, talk to developers, and chase news until it’s got nowhere left to run. Stay tuned.